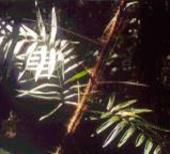 This vine grows in areas of disturbance in subtropical rainforests. Clumps are formed from a gathering of a few stems which develop in chaotic tangles of twenty to one hundred metre long canes. The older smooth canes can be used for weaving, tying and construction purposes. The growing end of the vines has chestnut spines that also occur on the leaf internodes (areas between leaf structures). 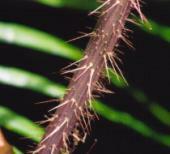 The stems have compound leaves which also have prickles that protrude vertically on the leaf edges and stalk. Opposite each leaf there is a stiff leafless stem of one to two metres in length with backward facing hooks which allow the plant to be a successful canopy climber. These hooked stems are known to catch on to people's clothing, giving it the common names - Wait-a-While, or Lawyer Vine. It produces insignificant flowers at the end of this stem which develop into scaly fruits. Inside the fruit is a thin flesh, tasting like dates and a tough brown seed. The seed takes three to twelve months to germinate. The young shoots are also edible, which are soft and taste sweet. The 'Wait-a-while' is one of the most notorious of plants in the Daintree, with nasty spines on the leaves, stalk and most especially on the long, whip-like flagella, enabling the plant to climb into the competitive rainforest canopy. They are also known by the name of 'rattan', for related species provide the raw material for much cane furniture in tropical Asia. The most common species around the Daintree forests are the fairly similar 'Hairy Mary' (Calamus australis), with less leaflets, and the 'Viscous Hairy Mary' (Calamus radicalis), with many more leaflets, as well as the more distinct 'Yellow Lawyer Cane' (Calamus motii.). The latter has, as the name suggests, much stronger yellow hooks on the midrib of the leaves and the sheath of the plant, which is quite large and stiff and when flicked makes a 'plunk' sound. This latter species can be found along Marrdja boardwalk. This wait-a-while has distinctive and strong yellow hooks (thus the common name) on the midrib of the leaves and the sheath of the plant. The sheath itself is quite large and stiff and when flicked makes a 'plunk' sound. Mottii is a local aboriginal word. Yellow Lawyer Cane plants are found in rainforests of north-eastern Queensland to an altitude of 1000 metres (Cronin 1993). This species can be found along Marrdja boardwalk.